Pests and diseases can attack specific stages in the lifecycle of the honey bee and they can also attack specific castes. This publication covers the management of pests, diseases and other disorders of the honey bee. Published in 2014 and 2016. 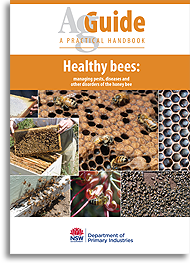 Healthy bees is part of the AgGuide series and is 75 full-colour A4 pages. This short ebook is a free bonus chapter to the Healthy Bees AgGuide. It contains a practical step-by-step guide to testing for hygienic behaviour in your bees. Hygienic behaviour is a characteristic of honey bees that promotes resistance to many pests and diseases. It is only available as a multi-touch book for use on iPad, iPhone and iPod. Download from the Apple iBookstore.